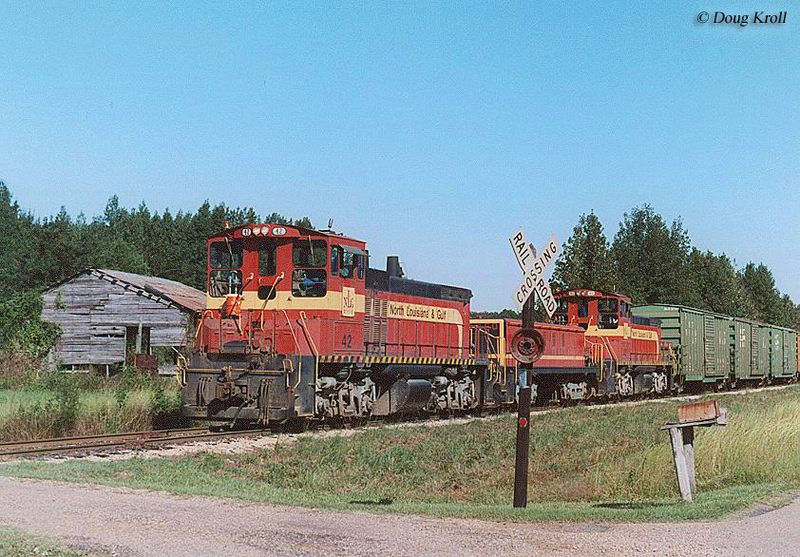 The North Louisiana & Gulf Railroad (reporting marks, NLG) is another historic southern shortline, which was established to move lumber and related traffic. 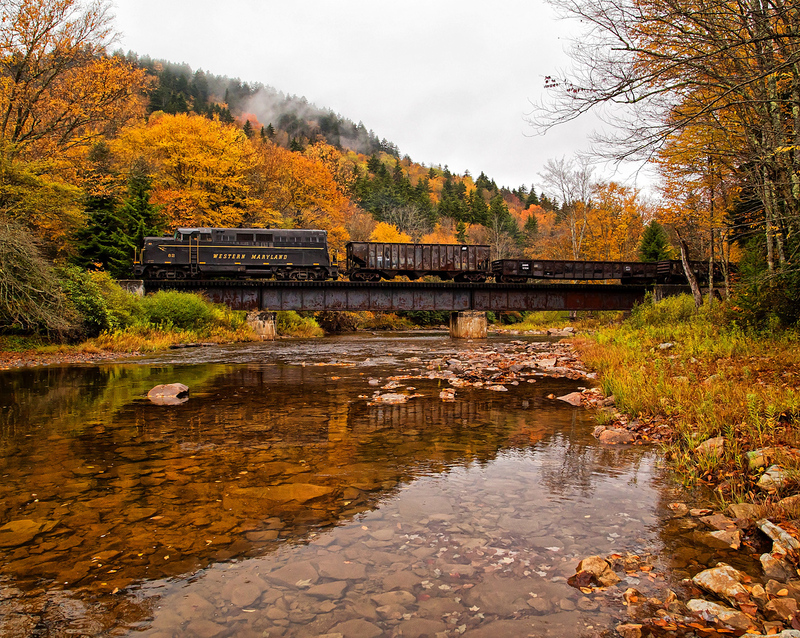 The NL&G route dates to the first decade of the 20th century as a subsidiary of the Huie-Hodge Lumber Company and slowly grew in size by taking over small, unincorporated logging lines and added them to its system. 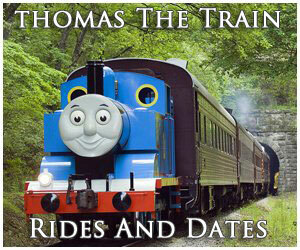 Its final growth occurred in the late 1940s when the railroad picked up a section of a former Louisiana & North West. Over the years, the NL&G's traffic always remained based in timber products with connections to two Class Is and shortline L&NW. In the late 1980s the company was acquired by the MidSouth Rail Corporation, an early shortline portfolio company (similar to today's RailAmerica or Genesee & Wyoming). 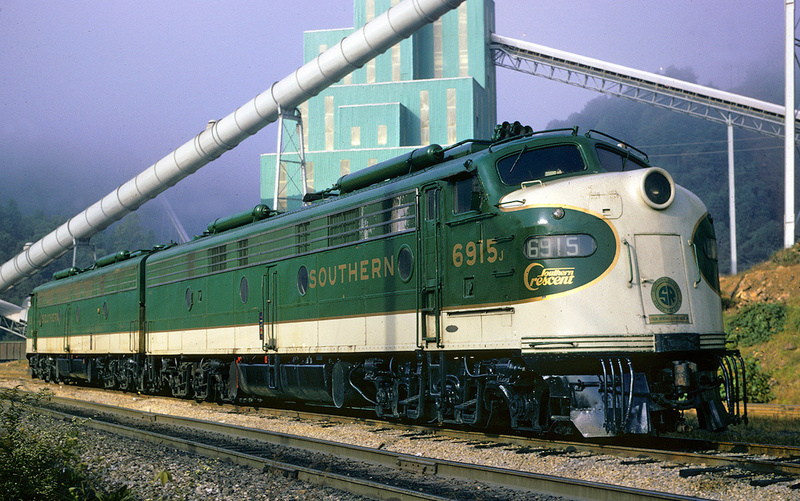 Then, in the 1990s MidSouth and its properties were acquired by Kansas City Southern. Today, the NL&G name still survives on paper, as a leased asset of KCS. 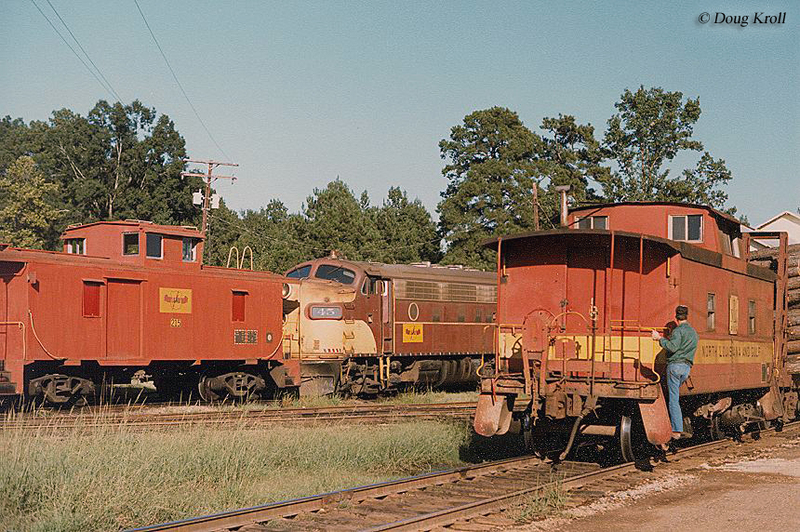 The North Louisiana and Gulf Railroad was formed essentially from a need to haul both hard and softwood timber. It all began in 1901 when the Huie-Hodge Lumber Company, Ltd. was incorporated on February 25th to tap the rich forests of northern Louisiana. At first the company constructed a sawmill at Hodge to serve exclusively soft pine but soon after added another mill at Danville to work the hardwoods (they would also add a third operation at Bienville in 1909, purchased from another timber company). In 1902, Huie-Hodge began operations of a privately-owned railroad to connect their mills at Hodge and Danville, a distance of 10 miles. The then incorporated road interchanged with the large Chicago, Rock Island & Pacific (Rock Island) at Hodge, which had a southerly line extending from Little Rock, Arkansas through southern Louisiana at Eunice. 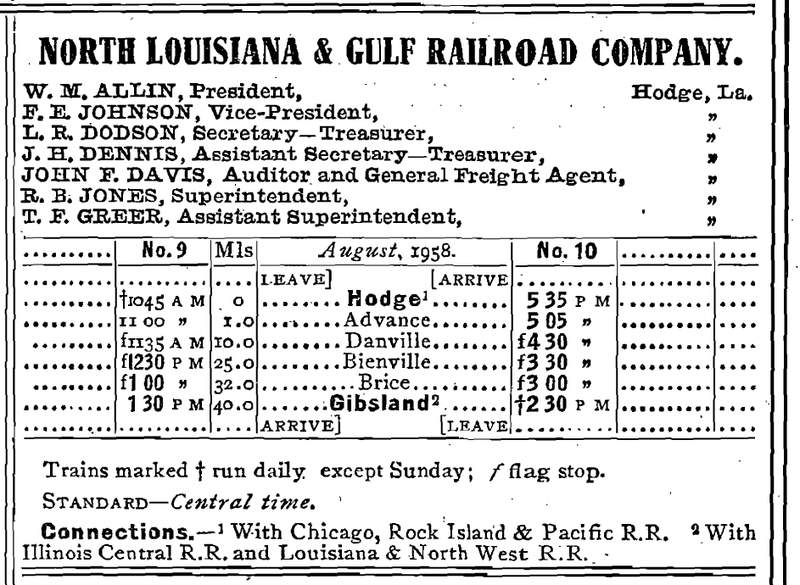 It was decided to formerly incorporate the rail line, chartering the North Louisiana and Gulf Railroad Company on January 22, 1906 as a wholly-owned subsidiary of Huie-Hodge. Under the new NL&G the road not only controlled the original 10-mile logging route but also a line running between Bienville (where a connection was made with the L&NW) and the tiny hamlet of Walsh (built by other logging interests around 1907). Eventually, the NL&G was able to connect these two sections of railroad after completing a 16-mile corridor between Danville and Walsh which opened in 1911. In general, the right-of-way was relatively flat although it did require some 49 small wooden trestles to span small creeks and bogs. Interestingly, when the North Louisiana and Gulf Railroad was original founded its charter was only set for 10 years and had expired by 1916. However, it continued to operate without a charter for another decade before being rechartered in September of 1927 under the same name. In 1921 the NL&G's parent was renamed as the Hodge-Hunt Lumber Company and for the following two decades little changed on the road except the constant movement of timber and related products such as pulpwood and paper. 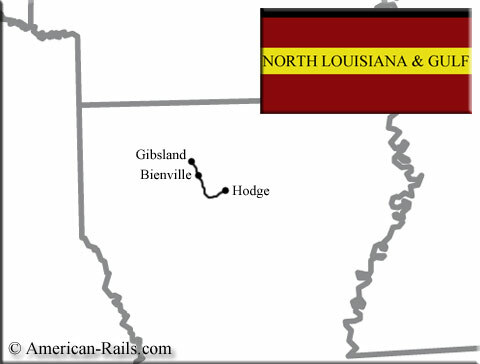 In 1949 the railroad acquired a 15-mile section of the L&NW running from Bienville to Gibsland, which was being spun-off giving it an additional connection to the Illinois Central (at one time the L&NW stretched from McNeil, Arkansas to Natchitoches, Louisiana). At this time the NL&G was operating 40 miles of trackage, which gave it a rough "L" shape running southeastward from Gibsland to Danville and then due east to Hodge. During the steam era the NL&G relied on small designs as primary power including 2-6-0 Moguls and 4-6-0 Ten-Wheelers manufactured by a variety of builders such as Baldwin, Davenport, and the Danforth Locomotive Works (all of which were acquired used). The railroad remained a fully steam-powered operation until the arrival of two General Electric 70-tonners in January of 1950, #101-102. It would acquire two more of these switchers, #103 in September of that year and #104 in January of 1954. 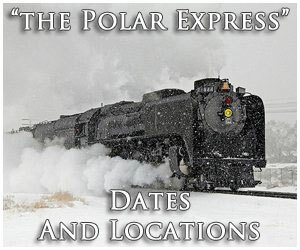 Also, in December of 1950 the railroad picked up two former L&NW SW8s, #39-40 and then purchased two others new in December of 1953, #37-38. 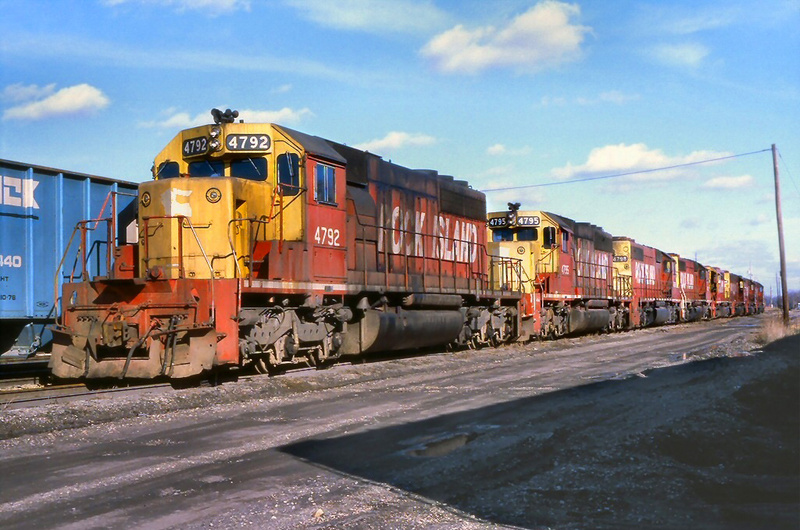 The railroad used an all-switcher fleet until acquiring a former Conrail GP38 road-switcher in late 1967 but got back to its 1975 by purchasing four new MP15DCs, #42-45 (for a time in the mid-1970s it also leased KCS F7s). For a complete diesel roster of the NL&G please click here. 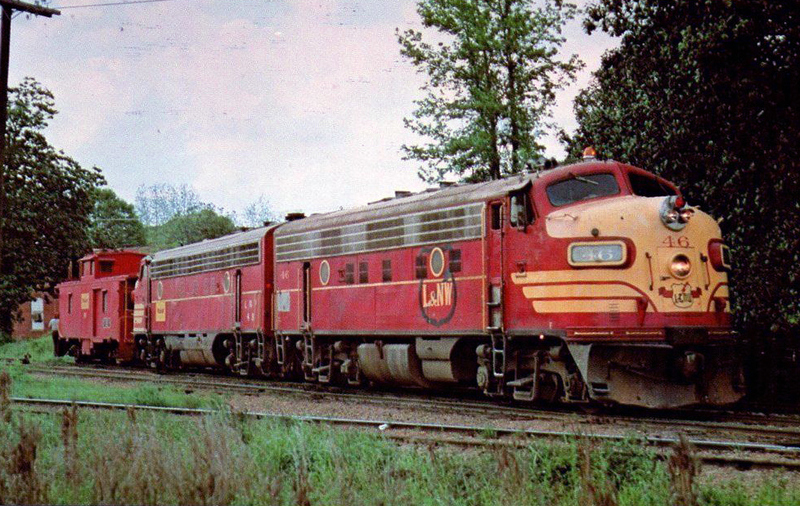 All of its diesels wore an attractive red and black livery with yellow trim. On September 8, 1987 the NL&G was purchased by the MidSouth Rail Corporation, a company formed a year earlier from ex-Illinois Central lines through Mississippi and Louisiana. After MidSouth picked up the NL&G it created a new holding company for the property called MidLouisiana Rail Corporation. At its peak MidSouth was operating some 1,200 miles of trackage which was taken over by the KCS on January 11, 1994. The purpose of the Class I's interest in the lines, now known as the Meridian Corridor, was to connect with Norfolk Southern. Today, the NL&G still exists on paper but is no longer an independent operation.